Morning ladies, I've got the next installment in Mabel Figworthy's Fancies Song of the Weather SAL for you today. This is July's block. I did most of it whilst on holiday and just finished the beading when I got home as I hadn't been organised enough to read the supplies list and take the beads with me! All my threads for this project live in a little bag so I just took that. 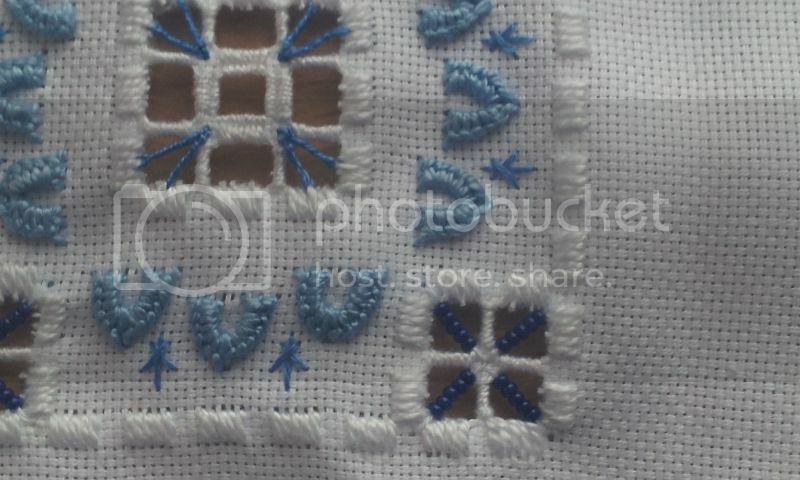 I enjoyed this month, the horseshoe detatched buttonholes (the ones that look like horseshoes, funnily enough!) were pretty tricky at first, and it wasn't helping that my husband and my niece were making me watch Demolition Man whilst working on it... but I got it in the end. The beads are navy Preciosas size 11, some that I bought for the knitted wedding bracelet I made, but were the wrong size. June's block saw me finish the first sampler as I'm making two both 2 columns x 3 rows, so this was the start of the new sampler. I still haven't finished the first as I want to add borders. Unfortunately, all my Hardanger books, along with most of my craft books, are trapped in a corner behind an oven, a table and a large TV, all covered in brick dust! Some things are just going to have to wait until I have access to all of my house again. The beads are a nice touch! Oh my heavens, there are BEADS in the corner squares - DIVINE! 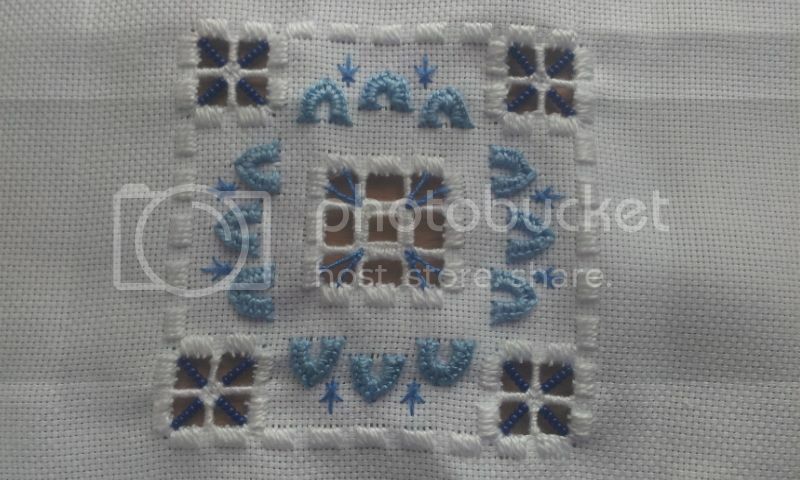 The horseshoe stitches are cool too! What a lovely block. Hope you can get to your supplies soon! I like it :) What will you do with them all when they're finished? So very pretty. I do like the white and blue colour combination.